Honestly that's why I don't have vortecs. I already have my m/t valve covers, performer rpm intake, and buying rockers wasent something I wanted to spend my (very limited) car budget on. The heads I used I got for free. Put $400.00 (appx) in machine work, valve grind, etc, and was a big improvement. I estimated a vortec swap (with all related parts) at the $1000.00 range. I'm sure the vortecs would probably be all around better, but I have a 5 year old and a 7 week old so the almighty dollar rules. but your setup sounds good, i have a intake already and dont wanna buy another one really. Look under the valve cover and find a part #. Look online to see what you have. I don't remember what site I used , but googling it should get results pretty easily. My guess is You probably have 76cc "smog" heads, but you may get lucky depending what has been done to your car in the past. It's expensive to do any kind of engine build these days. 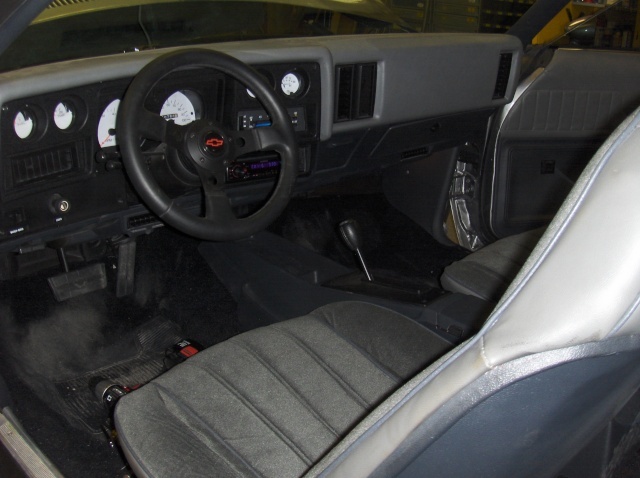 yeah your telling me, on another note has anyone seen or made a dash with custom gauges? or you think i can get away with getting the camaro one? thepossumface wrote: yeah your telling me, on another note has anyone seen or made a dash with custom gauges? 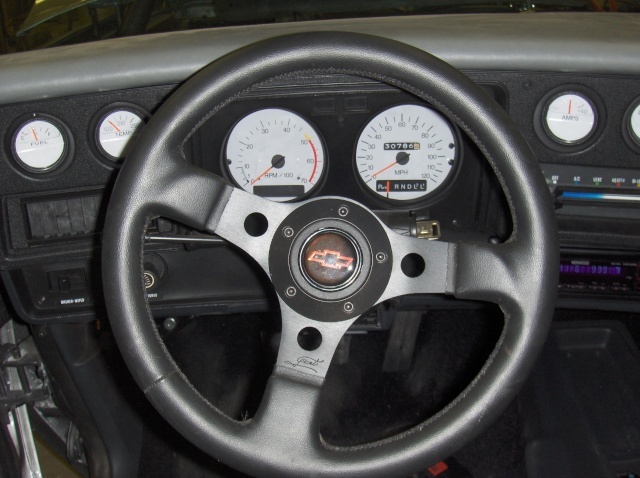 How about fitting aftermarket gauges into the existing dash? These are the VDO Cockpit series. VDO is the only gauge manufacturer I could find with a 4" speedo and tach available, and they have almost a full complement in this series, including the transmission gauges I have on the pillar. The only exception is the fuel pressure gauge from Nordskog on the console. i think i saw this pic on google once, but yes I would like to keep the dash just aftermarket gauges like these but know the name of them? or what they run? A 4 1/2" gauge would have been perfect, but 4" was as close as I could get. The two most popular sizes other manufacturers make are 5" (too big) and 3 5/8" (way too small). That's on a Monte -- yours might measure out differently, so you might have more choices. found these and I got a cupon for 20% off not to bad for a temp setup I may run these with a brighter bulb and Ill need a wiring on how to hook up the lights up though, cant seem to find a shop book. The smaller gauges are all 2 1/16", which is a standard size that every manufacturer makes, so you should have no trouble finding something you like by somebody. However, different manufacturers will have different lighting setups, some of which will be proprietary, and many will come with a plain-jane white incandescent bulb. One of the things I liked about VDO was that I could swap in sockets and LEDs and have any color I wanted, and the colors are truer than what you would get with an incandescent bulb. The LEDs also come in a nice green. Keep in mind that gauges are one place where the rule "you get what you pay for" holds true. While those will work for a while, the gauges themselves will be mechanical, meaning you'll have to plumb an oil line into your cabin to the pressure gauge, and sooner or later those always spring a leak. Electric cost more, but are definitely the way to go, even if you have to buy the gauges one at a time as you can afford them. Also, a voltmeter will tell you more than an ammeter, and the ammeter can only handle so much juice and will be a PITA to wire. Any respectable set of gauges will come with the necessary wiring diagrams, but if you should find yourself stumped a lot of people here have already been down that road and can offer their wisdom, and probably copies of the factory wiring diagrams. Do you already have the round style factory gauges? If so, why not get some white covers for them and use a green LED. You can find the covers for 20 bucks on Ebay. I and someone else has a set, they look really good! Here is mine that I did if it helps. 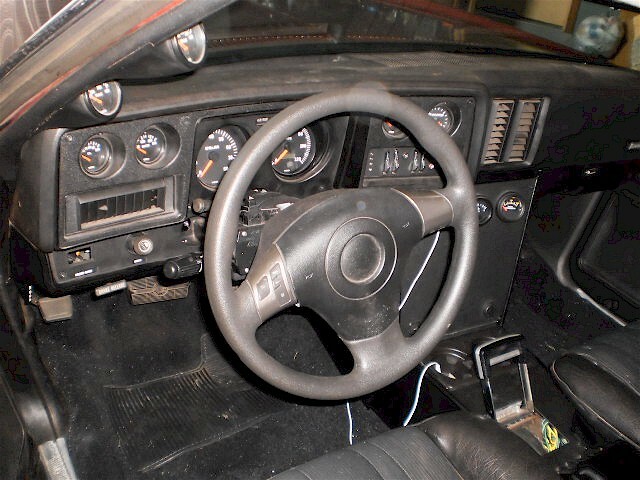 It makes the dash look a lot better and they are stickers so it doesn't matter what the original gauges looked like. I'm very happy with mine, and being in Arizona with the high heat, they have not discolored or lifted after 8yrs.. Still looks as good as they did when installed. Heck even the LED's still work great. Remember, you can get those in several colors. The LED's really bring out the gauges! i just moved the dizzy around in the spot it was taken out of i marked it, and the carb spit fire and almost kept on lucky i had a towel to put it out. When an engine backfires thru carb. timing is too far advanced, when it backfires in the exhaust it is too far retarded. 1 tooth on the dizzy, you can make up for on the turning of the dizzy once engine is running. 2 teeth or more and the dizzy will have to be removed and lined up again and reinstalled. You are getting spark, just not at the right time. You might still be off on the initial timing of the dizzy. I think you might be too far advanced. I recommend pulling it out completely and starting from scratch. Are you aware the dizzy turns the rotor as you remove from engine? It may have turned more than you anticipated when you reinstalled. Here's what I suggest. Remove dizzy completely, turn engine over until mark lines up with tab on timing cover. HOWEVER, you need to know for certain which stroke you are on. Remove drivers valve cover and watch the 2 front rockers as you rotate the engine. When the front,(exhaust) rocker is closing and just as the 2nd(intake) rocker is starting to open. That's where true TDC is. Make sure you get it right, you might have to spin engine over a few times to get it exact. Then turn rotor backwards to about 3 o'clock position, and install in engine. As dizzy drops, it will turn clockwise, and wont drop all the way down. When I know I got it where I want it, I rotate engine until dizzy fully drops. This is making the oil pump shaft, and dizzy connecting with each other. You could physically turn the oil pump with a screwdriver, but its very hard to get it right to line up with dizzy as it turns and drops into engine. Once the dizzy is in engine, button everything down and turn dizzy as you crank engine to find the sweet spot, once it fires and stays running then go back and time with a timing light. 8 degrees before TDC, on the timing mark and tab. Lets us know how you make out.